When OWC’s new dual bay Drive Dock arrived for review, by coincidence my backup drive stopped working soon afterward. It was a USB3 drive in a case from a well-known hard drive company. Phooey. I took apart the case and extracted the bare internal drive. Then I connected Drive Dock (DD) to my geezer Mac Pro monster, inserted the bare drive into one of DD’s two toaster-like slots, and waited for my drive to mount. No dice. Dead drive in Drive Dock means new Nemo drive purchase from OWC. What to buy to replace my sad, deceased external USB3 drive? No case? No problem! Buy an affordable, fast, high-capacity bare internal drive from macsales.com, and use it with DD. Keep this new exposed drive protected in its original plastic case when not in place within DD and it will last for years if I’m careful. 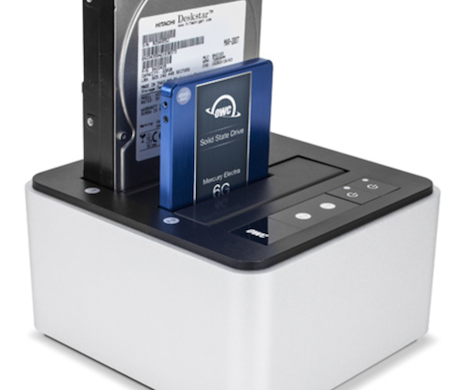 When I need to clone or archive or copy data or files or anything from one internal drive to another, I can use both slots in the new dual DD, whether full size 3.5 inch or small 2.5 inch size SATA drive. Ditto for transferring content into or out of my computer. What’s the problem? The price? Nope. It’s a professional quality technology item at a low price, so order one today and quit grumbling about your ancient USB and FireWire external drives in their funky old cases. If you are a tech pro of any kind, or a high-volume media consumer, you will make up DD’s cost quickly both in money saved on drives and on time saved by its astonishing speed. DD works quietly and efficiently at zippy USB3.1 speeds. A Thunderbolt model is available for $200 more; most of us can buy extra drives instead of spending that much. Each drive bay has its own power unit and LED activity light. Make sure you eject your drives from your Mac’s Desktop before you hot swap a different one. Hint: wait a minute or two for the internal platters to stop spinning to add years to the life of your exposed drives. Tim Robertson and David Cohen have been discussing this product for several recent episodes on their Tech Fan Podcast, which is sponsored by OWC MacSales.com. 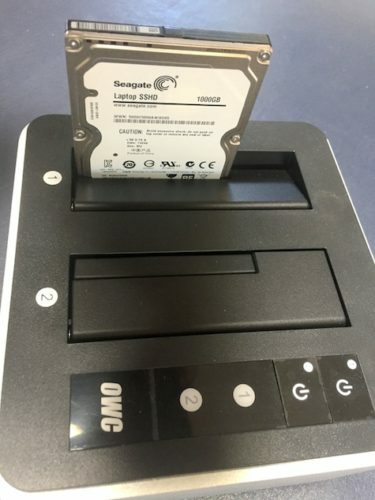 Tim purchased a OWC Drive Dock USB — Dual Drive Bay Solution three weeks ago and he uses it daily with a strong recommendation. OWC has an outstanding product with their new Drive Dock, including its speedy USB 3.1 port and cable. If you are a techie or professional who regularly has exposed SATA drives in your workflow, get one or more of these affordable docks today. Hard drives are inexpensive and reliable. This USB 3.1 Drive Dock is affordable and versatile. You know you need one, so order it today. You’ll be glad you did, right, Tim?